Age: 30 Height: 6' in normal state, 9' when flaring. Talents: Martial Arts B & E (Saiyan Shotokan), Military, Pilot (space). Growth - Atomic Gain: permanent, 20' tall, weight of 4 tons, is +1CS to hit, SY(200) Strength, SX(150) Endurance, Health is changed in proportion. Power Flare: See Saiyans. The only difference in Broli's case is that he only needs to make a Green Endurance FEAT to maintain the Flare. Energy Manipulation: Broli has the SX(150) ability to collect all the ambient energy within a 2 mile radius and focus it into one ball of energy and throw it for up to 100 points of force and 50 points energy damage. In space, Broli can use this power at its maximum and gather energy within a 8 mile radius. In a planet's atmosphere, Broli's energy ball's are limited to 75 points of force damage and 40 points of energy damage. Only in humanoid form. On a Yellow FEAT, Broli can focus the energy he has gathered and fire it through the gem on his necklace(The gem is of Am(50) Material Strength.). The resulting energy blast does up to Mn(75) energy damage and In(40) force damage to the target. The energy blast travels in a straight line from his chest to the target. On a Red FEAT, Broli can channel the collected energy into his hyperspeed, flight powers, and/or Agility. He can increase the ranks of these powers by up to 25 points each. He can only do this while "flaring" and in "Shift" form. Force Field: Un(100) active personal. He used it to protect himself from the effects of being submerged in liquid magma. He cannot use this power and his energy manipulation at the same time. Weakness: See Saiyans. 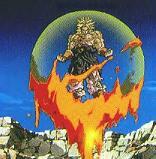 Because of his traumatic rebirth, Broli suffered irreversible brain damage. His Saiyan instincts have completely taken over his mind. As a result, Broli suffers a -2CS to his resistance to his genetic fighting instincts. For a time, his father was able to control his fighting rages with a mind control device. Broli had built-up such a resistance to it, that mental attacks rarely effect him. Note: Broli is a Super Saiyan (See Saiyans, SS2). His birth was prophesied since the dawn of the Saiyan race. Unfortunately, he has become a force of chaos in the universe. It took the entire Z-team to defeat him in his humanoid form. It is highly unlikely that anyone, short of maybe the Hulk, another Super Saiyan (in Uzaru form), Galactus, Thor, Kurse, Tyrant, Tri-Sentinel, or Captain Universe could go toe-to-toe with Broli in Uzaru form.